We have been hearing the term “smart city” ever since the Information Technology revolution hit India in the late 1990s. First it was Hyderabad, which was often referred to also as “Cyberabad”, and then there was Pune. What’s common between these two cities? They have both become regional IT Hubs, with several call centers, back offices, plenty of startups, and some of the country’s leading IT giants such as Infosys, TCS, Wipro, HCL, Cognizant, and others. Yet the term “smart city” was also coined once more during the recent general elections held in April/May, albeit with a difference. This time, “smart city” didn’t refer to IT hubs, though Prime Minister Modi, who eventually won the elections, is probably India’s most tech-friendly and forward-thinking head-of-state after Rajiv Gandhi (1984-1989). During the election campaign, Modi announced that his team, the BJP, if voted to power, would come up with 100 smart cities all across India. However this time, the term “smart city” was used to refer to cities that are going to use technology to offer more structured and hospitable living conditions for residents. Since forming the government, Modi and his team have taken up its plan to create these 100 smart cities throughout the country. Some of them have already been identified. It’s a US$1.13 billion plan. “Our government is working on a plan to build 100 smart cities across the country with GIS-based (Geographic Information Systems) town planning, using the latest technology. These cities will have integrated waste management and advanced transport system,” said Venkaiah Naidu, India’s Urban Development minister recently. There’s a definite buzz about this program at all levels of government these days. The states are busy too, as most of the work is going to be implemented through the respective state government machineries. What Are These Smart Cities? The 100 Indian smart cities are going to run completely on technology, whether it is for water, electricity, transport and traffic, recycling and sanitation, surveillance systems, or building security. There are going to be Wi-Fi-powered houses and open spaces, minimal human intervention, and high-speed connectivity. Plans have been made to link up the suburban train networks with pedestrian and cycle lanes and carry people directly from point to point through pods with no stopping at intervening stations. Real-time transport displays will provide visibility of public transport as well as the conditions of traffic on routes. Digital parking meters are going to send information to mobile phones when a space opens up. A master plan has already been developed by CISCO Systems. And the US President, Obama, has also announced that the country is going to help India develop three of these smart cities – Allahabad, Ajmer and Visakhapatnam. India is looking for more such associations. The country could certainly do with all help it can get. Interestingly, some of these cities already exist, such as the holy city of Varanasi, which is Modi’s constituency as well, Allahabad, Kanpur, Jaipur, Udaipur, Ambala, Patna, Bhagalpur, Bhopal, Indore, and many more. They are just going to be transformed into smart cities, as technology comes in to better the lives of residents. However, some new cities are going to be set-up from scratch as well, mostly through the private sector. Land is being identified currently for this. Respective state and the union government are going to support all such initiatives in all possible ways. The mega-metro cities of India, Delhi, Mumbai, Kolkata, Chennai, and even Hyderabad and Bangalore are bursting at the seams. Like many areas in the world, there is a definite population shift to the cities from rural areas in India too. That is part of the problem. 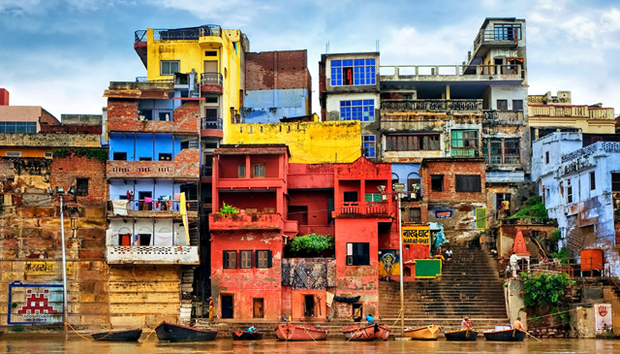 Many Indian cities house more than a million people, or close to it. Add to that the constant inflow, and what you get is hardly any space for more residents. But they keep coming anyway, expecting better jobs and a better lifestyle. The result of this is very much evident everywhere. Infrastructure is creaking. One in six city residents lives in urban slums with unsanitary conditions. For instance, with a population that is estimated to be close to a million, Dharavi in Mumbai is among the largest slums in the world. Many slum residents have televisions and cell phones and decent bank accounts, but there is no sensible place to live. Property values have skyrocketed over the last decade because of a demand-supply gap. And not just that, the roads are cramped too, because there is no space to make new ones. There is far too much pollution, and hardly any parks and greenery left. Living conditions are far from satisfactory. One problem with cities like Mumbai and Kolkata is that there is no space where they can spread. Mumbai has the sea surrounding it from all sides. Land filling has been done in recent times to create living spaces, but it’s far too costly for a country like India to do this consistently. Kolkata has a different problem. To its east are wetlands and to the west is the Hoogly River. The city is thus stretched north-south for miles, and cannot do it more because of land conflicts. So India’s 100 smart city program is definitely timely. The country needed something like this. Not only does the country need more cities, but it also needs better infrastructure and smarter living. The Modi government has taken a step in the right direction. 100 Smart City Program – Can This Really Be Done? Of course it’s going to be a challenge for the country to implement the smart city program. This is a problem everywhere in the world. And things are always more of a challenge in India where local municipalities currently do not have the capability to even link various services and facilities such as water, sewerage, electricity, health, roads, and others. Anant Maringanti of Hyderabad Urban Lab is however more optimistic. He says that if India’s rich Information and Communications Technology can be deployed efficiently, then it would definitely make life easier for people. But whatever happens ultimately, if Prime Minister Modi’s lofty plans can be implemented even partially, then too, the people living in Indian cities can definitely expect smarter and better living in the future. That’s something, given the condition of many of these cities today. « UK: Cyber Security Guidelines to Promote Human Rights?